At LinxPrint, we understand the importance of a flawless finishing touch to ensure the authenticity and the look of the final product. 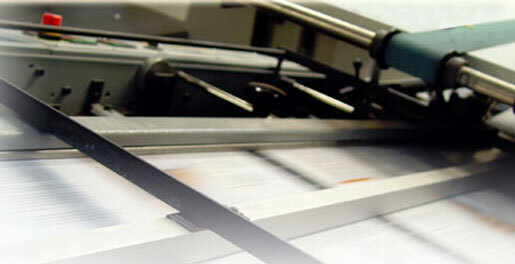 We, therefore, offer a full range of high quality binding and finishing options to meet the demands of any print job. Saddle Stitch - Magazine style finishing with two staples at the spine. Works best for page counts of up to 60 and is reasonably cost effective. Perfect Binding - Book Style binding where pages are glued or stitched together at the spine. This is a processes whereby metal dies are used to give paper or substrates specific shapes or designs that cannot be accomplished by a straight cut. An alternative to a square cut, corners on business cards, postcards, or rack cards, maybe rounded for a uniquely designed look. A process where either a portion of your image or the entire page is coated with a high gloss varnish. Sport varnish is only available for offset printed jobs. Flood varnish is available on all jobs. Flood varnish is a great way to make your product stand out. This process adds a plastic film to either one side or both sides of the printed sheet. Lamination is useful for jobs that require the material to be more durable. It adds some waterproofing properties to the product available in gloss or satin. When you are looking for a high shine metallic finish, foil stamping would be required. Foil stamping is a process where a metal plate with an engraved image strikes a foil film, transferring the foil coating from the roll film onto the substrate that is to be imprinted. The substrate then receives the high-density metallic finish, resulting in a reflective image with a bright and dense metallic appearance. This is a high end finishing option that can separate your promotional material from the pack. Thermography is a process which results in raised print. This is a process that applies pressure to the backside of a material giving it a three dimensional or raised effect. The procedure involves the use of two dies, one fitting into the other so that the raised die forces the stock into the recessed die to create the embossed impression. De-bossing is the opposite of this effect where the image is recessed.